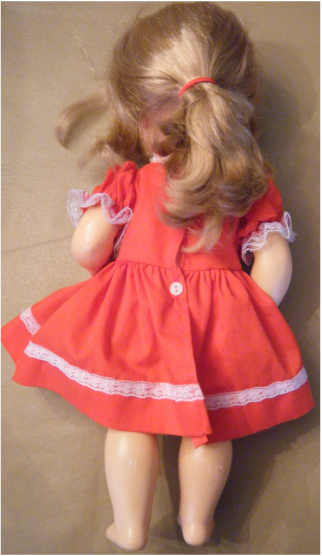 Hi Dottie is a Mattel doll first released in 1971. She is a phonograph doll that activates when a phone is placed in her hand and a hidden button is pressed. She would have come with a "Mommy" princess style phone and a smaller doll phone. These pieces are hard to find. From what I have been able to determine from the internet, few of these dolls still work. The box states that she says 11 different "friendly" things. The box itself could be converted to a telephone booth by punching out some perforated panels. This doll belongs to my niece, and it does not work. Unfortunately, this is the type of doll that would require cutting open as she is not fastened with screws. My niece has not decided whether or not she would like to crack open the doll to repair the phonograph system. I can hear the phonograph turning when a battery is installed and the switch in the hand is pushed so the likely failure is a broken drive belt. Perhaps I will have more to add about this doll in the future. This doll is intended to hold a phone in her left hand (to the right in the image). When a button in the hand is pushed a phonograph is activated and the doll has a conversation with her "Mommy". 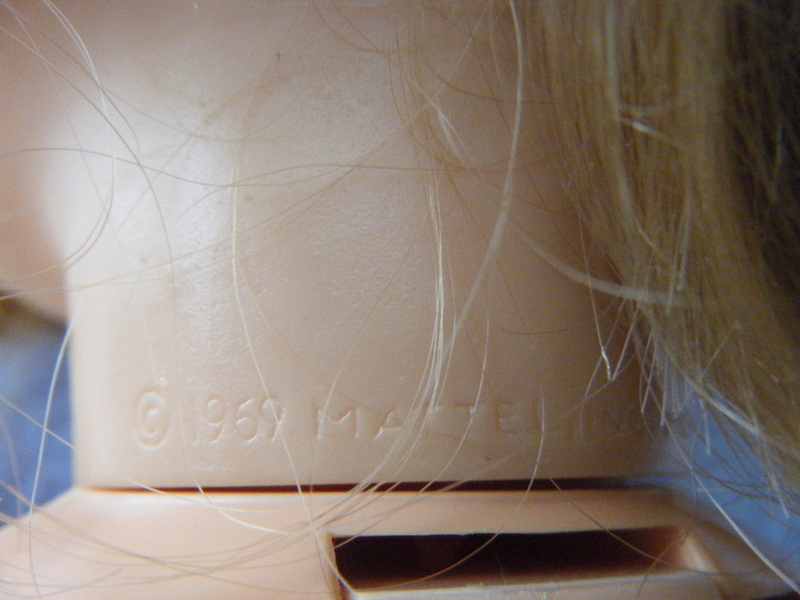 The head bears a 1969 MATTEL INC. stamp even though the doll was released in 1971. 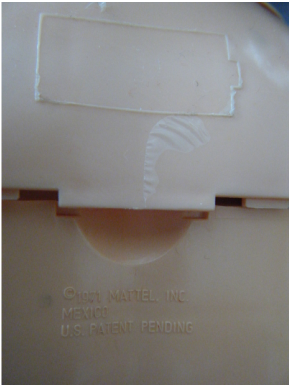 The top of the battery compartment is visible at the bottom of the photo. The doll has a speaker grille in her tummy. A plastic speaker cone is visible through the grille. This doll operates on a single D battery. I didn't photograph it, but the compartment door is designed to have a built in battery ejector. Notice that the body is dated 1971.